Steph and I have read a lot of books trying to prepare ourselves and our lives for the new baby. Some of these books we liked, and some of them we loved. This book is one of my favorites. The authors are Gary Greenberg and Jeannie Hayden. ‘Be Prepared‘ is a funny, yet practical book that is sure to bring a laugh. I enjoyed this book from beginning to end. Near the end of Steph’s pregnancy, I read the first half of the book, you know, to be prepared. I reread the first half of the book just after Gavin was born…during the midnight feedings. After Gavin turned 6 months old, I read the second half. The book is split up into categories (First Week, 0-3 Months, 4-6 Months, 7-9 Months, and 10-12 Months) so you can read the part that pertains to you and your baby. But, I’m sure that once you pick this book up, you will read it through from beginning to end. The ideas and information presented are very much the way a man would do things. It’s entertainingly useful and well organized, kind of like me! On a side note, this book makes a great baby shower gift for the dad, but only if he’s got a sense of humor about things. Well, even if he doesn’t, it may lighten his mood somewhat under the magnanimous pressure of pending responsibility of caring for another human. It’s definitely worth a read. 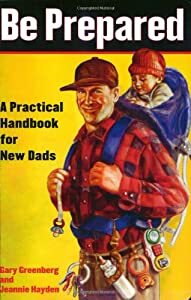 Everything you need to survive your first year of fatherhood. I highly recommend it. So all of a sudden, I’ve got a sense of humor. That’s right. Steph thinks I’m funny now. (When did I ever stop?) I’m funny like we’ve just started dating funny. We’ve known each other over 6 years and I’ve seen thousands of rolled eyes and breathy sighs about my lack of seriousness. But, the new Steph laughs at everything I say. Everything. When I say “Honeybaby, I’m going to take out the trash.”, she giggles as if she’s hearing “Honeybaby, I’m buying you a Gucci handbag in cash.” So now she finds me incredibly hot. What a difference 5 days and a daddyblog makes. Let me tell you how it’s spiced up our love life. Okay, maybe I shouldn’t.